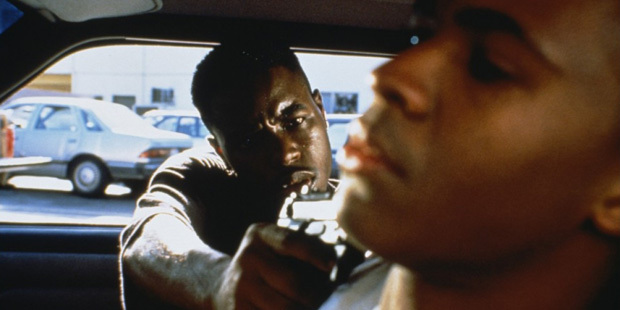 Menace II Society is set in South Central Los Angeles, and takes place during the aftermath of 1992 riots. 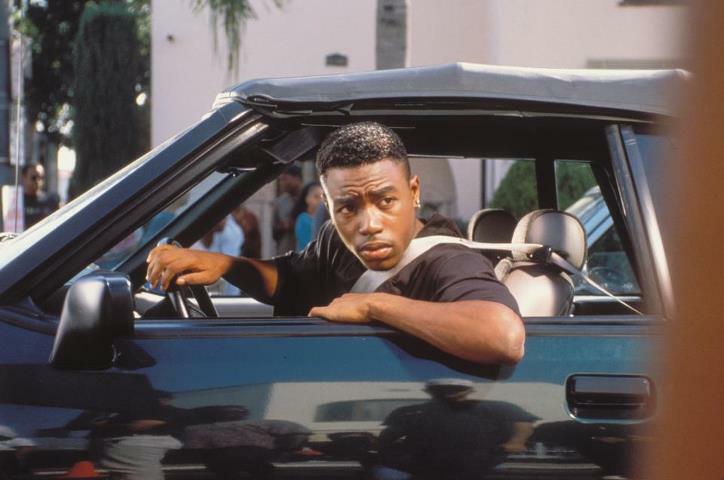 It tells the story of Caine "Kaydee" Lawson (Tyrin Turner). He’s just graduated from high school, yet his future looks bleak. 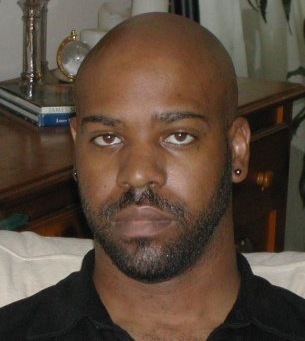 He resides in the Jordan Downs Public housing projects, home of the Eastside Grape Street Watts Crips. His first summer as a legal adult begins dubiously, to say the least. Over the course of three months, He graduates from petty crimes to violent felonies. His murderous running buddy O-Dogg (Larenz Tate) prods him along throughout the course of this evolution. Meanwhile, the ambitious Ronnie (Jada Pinkett) has other plans for him. She sees him as a diamond in the rough. Unfortunately, Caine can’t recognize the inherent value within himself. His lack of vision proves costly. Though they share many obvious similarities, Menace II Society was conceived well before the release of Boyz n the Hood. It came about during the early stages of a burgeoning friendship. Ironically, that friendship somewhat resembled the one depicted in Boyz. Though productive, this special connection took its sweet time in coming about. It might’ve never happened had a pair of talented fraternal twins remained in their birthplace until adulthood. Allen and Albert Hughes were born on April 1st, 1972 in Detroit, Michigan. They were of mixed racial heritage, with their father being African American and their mother being Armenian. At the age of nine, they relocated to Pomona, the seventh largest city in Los Angeles County, California. Around this time, Nicaraguan exiles Oscar Danilo Blandon and Norwin Meneses began wholesaling cocaine to Los Angeles resident “Freeway” Ricky Ross. That little business arrangement would change the face of hoods across America. As the crack cocaine epidemic was getting underway, the Hughes brothers’ love of cinema began to take root. During middle childhood, they adored seminal blockbusters like Superman and Raiders of the Lost Ark. On the cusp of adolescence, they discovered a wholly different brand of cinema by way of a most unlikely source: Brian De Palma’s 1983 remake of Scarface. A bit further down the line, they came upon the works of Martin Scorcese. Their ever supportive mother nurtured their budding interest in film. She bought them a video camera for their 12th birthday. They eventually cut their high school education short to pursue their chosen vocation. Before doing so, they shared their ambitions with High School pal Ryan Williams. Realizing that both parties had very similar interests, Ryan introduced the twins to his brother Tyger. Ryan couldn’t have known the perfect storm he’d brought about. Nor could he have anticipated the wondrous cinematic fruit it would eventually bring forth. This newly formed trio would effectively have the last word on a subgenre that had only just been born. By doing so, they would alter the course of Black Cinema forever. 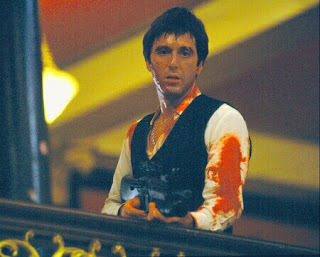 Tony Montana (Al Pacino) in a behind-the-scenes photo from the blood soaked climax of Brian DePalma's 1983 remake of Scarface.